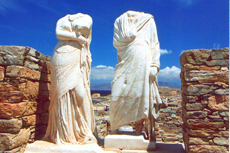 Perfect for visitors interested in Greek history, mythology and archaeology, the Island of Delos is the spiritual and geographic center of the Cyclades island chain, and the birthplace of Apollo and Artemis, the offspring of Zeus. Easily the BEST ruines I&apos;ve ever seen. Easily the BEST ruines I&apos;ve ever seen. 5000 year old city in pristine shape. Absolutely gorgeous. Don&apos;t miss it! Delos is a fascinating uninhabited island, reached by tender from Mykonos. Delos is a fascinating uninhabited island, reached by tender from Mykonos. If you are interested in archeology, go to see the Marble Lions and the House of Dionysus. Mykonos itself is charming but very crowded! Amazing - so interesting and such a beautiful historical place to visit. Amazing - so interesting and such a beautiful historical place to visit. Mykonos was also beautiful and we could have spent a bit more time walking around. One not to be missed if you are interested in history. One not to be missed if you are interested in history. Great little boat ride out to the island and then a very knowledgable guide whose passion brought the place to life. Really can&apos;t rate this highly enough. had a former research archaeologist as our guide - outstanding, & informative. Delos was breathtaking and really enjoyed the "Make your own mosaic class". Delos was breathtaking and really enjoyed the "Make your own mosaic class". Mykonos will be a place I visit again. Mykonos is just a touristy spot with some photo opps. Mykonos is just a touristy spot with some photo opps. Delos is an archaeological dig site for ongoing excavation of a Greek city destroyed 2,000 years ago. We were picked up at the tender and took a ferry to Delos. We were picked up at the tender and took a ferry to Delos. There we toured the museum as well as the archeological site. It is interesting, but also a litle hot in July. A good choice for people interested in history. Great knowledgable guide. Fun to get there, fun to see the ruins and hear the tales for our family. Plenty of time for photos. Didnt book anything with NCL for this port of call. The boat ride was very choppy--it almost made us sick. We booked through GetYourGuide and it was organized by Delos Travel. Well worth the money. Boat ride over to the island can be rough so take the necessary medication beforehand. This is. REALLY interesting place _ oh for slightly less detailed guides _ we barely saw all the main sites as a result. Delos is not to be missed. Delos is not to be missed. Since I&apos;m interested in archeological sites, Delos was a highlight of the entire cruise for me. This was one cruise ship excursion worth the money and time. This was one cruise ship excursion worth the money and time. the guide was very informative and the subject matter very interesting. Beautiful scenery on the boat ride from Mykonos. Enjoyed a short boat ride to Delos to see the ruins. Enjoyed a short boat ride to Delos to see the ruins. I thought the museum was almost better in some ways than walking around the ruins. We only had 15-min there - would have liked more. The ruins and the history. The ruins and the history. Definitely check out the museum. We had a very good and knowledgeable guide. We had a very good and knowledgeable guide. Avoid the cafe on Delos Island though, as it&apos;s incredibly expensive (take water and snacks). Delos is an incredibly large archeological site; having a guide was very useful, since there&apos;s very few descriptive placards. The area of Delos is stunning but our guide was a bit rude. It was a really windy day so the boat to Delos was delayed.